Reduction look glazes for Cone 5-6 electric kilns. Try them at Cone 10 too! Amaco Potter's Choice High Fire Glazes are America's favorite glazes for cone 5/6 electric kilns. They are designed to give look like high fire reduction kiln firing. They were created with the expert potter in mind but are easy to use and most are even classroom safe. Potter's Choice High Fire Glazes may be used on their own or layered to create limitless unique effects. Most of the Potter's Choice Glazes are food-safe, but you can still use any and all of them on the outside of cups and bowls or on decorative wares of any kind. These high fire Amaco glazes are available in pints, gallons, or dry so you can have exactly what you need for your projects. 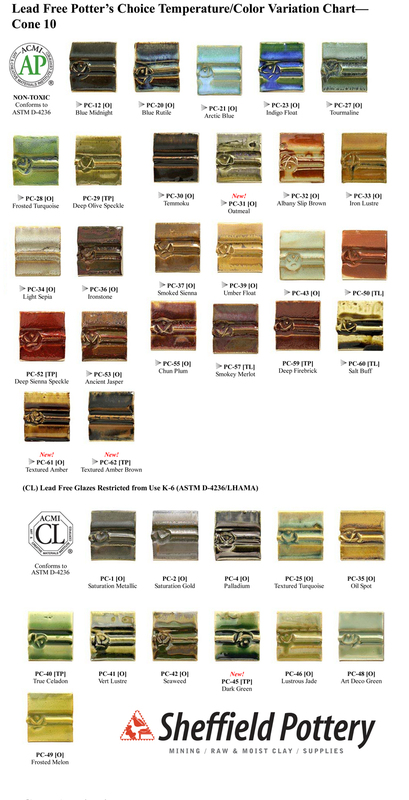 Sheffield Pottery carries the complete line of Potter's Choice glazes. They all have free shipping to anywhere in the USA. Those in pails and gallons are not free shipping to Hawaii and Alaska. Can successfully be fired to cone 10 !!! Amaco Potter's Choice glazes are available in liquid brushing pints and gallons as well as dipping 25 lb. dry. Please read label for each color since some require special application. 25 lb. dipping glazes* are packaged in 5 gallon buckets for easy mixing. *The following Potter's Choice glazes, PC-12, 20, 21, 23, 27, 28, 31, 33, 34, 37, 39, 43, 55, and 57, continue to be AP in their liquid form (pints and gallons) and carry the AP seal. 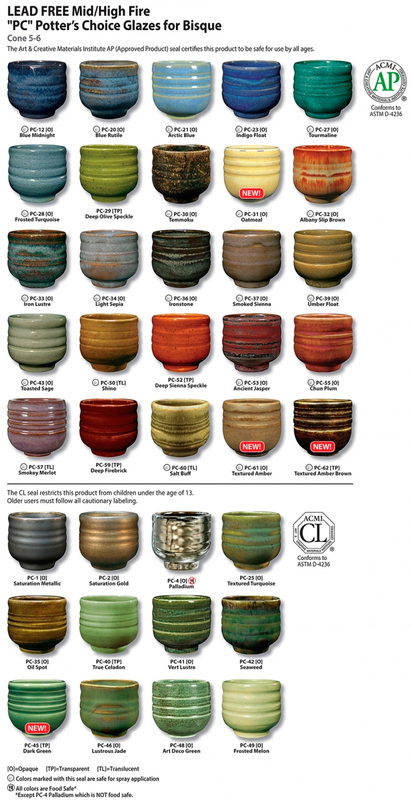 There has been a change to the labeling of the 25# dry dipping forms of these glazes. That labeling no longer carries the AP seal but "Conforms to ASTM D-4236".